Soon we’ll be assembling the combatants for our third naked bike shootout this year. Why another one? Because Yamaha’s new FZ-10 is forcing our hand. 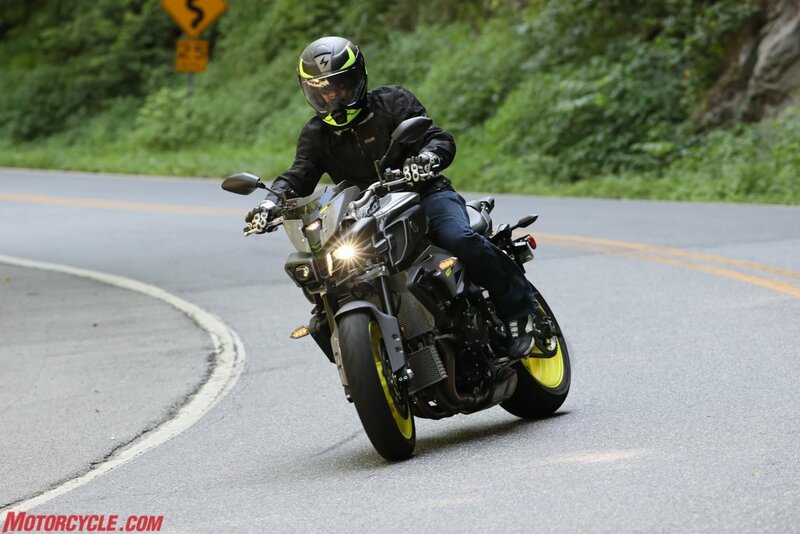 Our First Ride Review of the FZ-10 was published at the end of July, a mere week before our Naked Sports Six-Way Shootout hit the digital newsstand in early August. Prior to that, our 2016 Ultimate Streetfighter Shootout between the two reigning kings of the naked bike world – Aprilia and KTM – was published all the way back in April. Leaving the FZ-10 as ridden but not juxtaposed. So, as you can plainly see, we’re professionally obligated to take a day or three riding Yamaha’s newest naked and a few of its competitors through the canyons, maybe on a racetrack, possibly overnight somewhere distant with a nice view of the sunset from the seat of a well-stocked bar… I don’t know, I’m making this up as I go, but it’s sounding legitimate so far. Whatever we end up doing, the intent remains the same: Find out how the new Yammy stacks up against its naked competition. At the FZ-10’s media launch editor Siahaan discovered how to defeat the bike’s ABS system, and spent the rest of the day doing this. 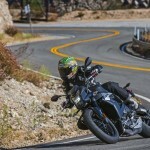 Whether or not he based his assumption of the FZ’s performance being comparable to that of the Tuono’s and Super Duke R’s ability to lock their rear wheels remains uncertain. 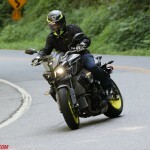 In his first ride review of the FZ-10 editor Troy Siahaan “stopped short of making any predictions on how the Yamaha would stack up against the other three super streetfighters, but I’m confident it’ll hold its own.” To be clear, he was referring to the BMW S1000R, Aprilia Tuono V4 1100, and KTM Super Duke R – two of which will not be participating in the shootout, the KTM and BMW. At $17k+ the KTM’s MSRP is too pricey for this shootout, and it’s about to become obsolete because of an updated SDR being readied for launch early in 2017. As for the BMW, a stock S1000R without the premium package is nearly impossible to find, pushing its MSRP with the premium package to over $15k, and it too is ready for retirement in favor of an upgraded version in 2017. So another shootout including the 2017 versions of the KTM and Aprilia is already preordained. 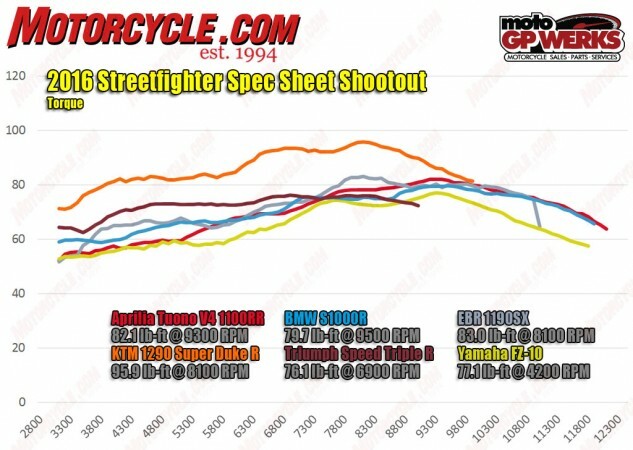 In the last streetfighter go around, the Tuono 1100 Factory defeated the Speed Triple S by a mere 3.3%. 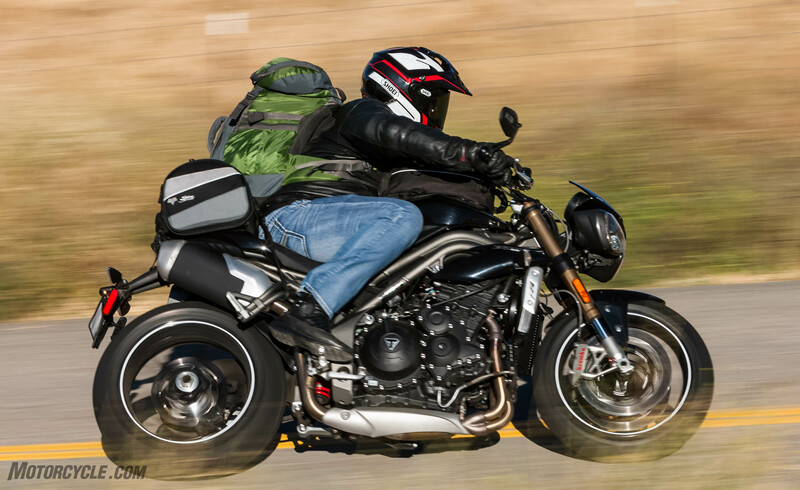 The R version of the Speed Triple brings to the table higher-spec Öhlins suspension, carbon fiber body panels, billet machined handlebar clamps, risers, swingarm pivot covers and rear wheel cover, red detailing, and a $1,700 price increase. For now that leaves us with the FZ-10 and EBR 1190SX, both priced at $13k, the Triumph Speed Triple S at $13,200, the Aprilia Tuono 1100RR $14,800, and Triumph Speed Triple R at $14,900. 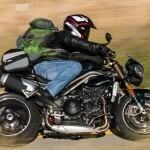 You may recall from our Naked Sports Six-Way Shootout that the Aprilia defeated the Speed Triple, but that test involved the upmarket Tuono 1100 Factory and base model Speed Triple S, so this time around we’re including the Speed Triple R and Tuono 1100RR, which may even the playing field between those two. 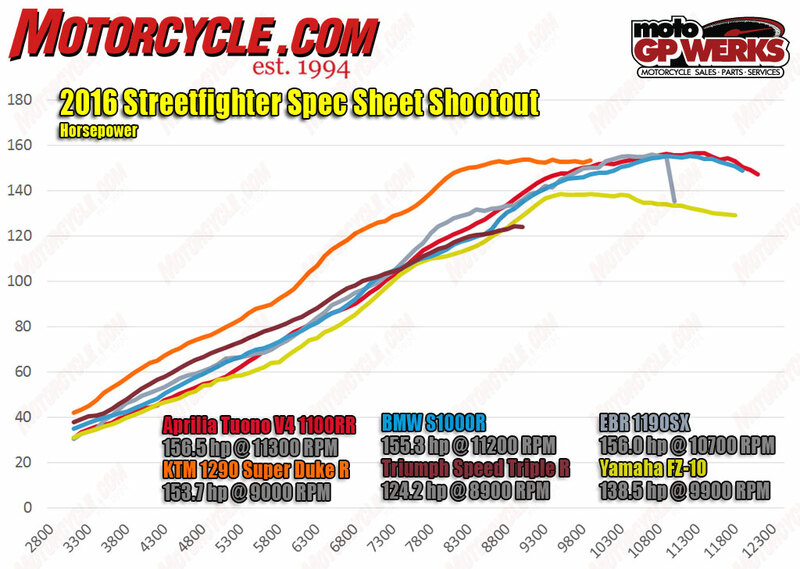 Looking at the spec sheet we find the FZ-10 shares a similarly short wheelbase with the EBR, compared to the others. The EBR also has a similar degree of rake to the Speed Triple, while the FZ’s is more in line with the other bikes. “It’s no surprise the 1190SX flicks from side to side with the greatest of ease,” Siahaan penned in his 2014 Brutish V-Twin Streetfighter Comparo. When we last tested the EBR 1190SX its MSRP was $16,995. That price has been reduced by $4k to a much more enticing $12,995, putting it dead even with the Yamaha as the two most affordable naked bikes here. Even though we’re bringing the base model Tuono to the fight, the Italian V-4 remains the odds-on favorite. At $14,800 it’s the most expensive bike of the group, but regardless its price tag, we know from previous shootouts how damn good it is. With the upgrades the 2016 Tuono received, we couldn’t even proclaim the mighty Super Duke R a clear winner over the Tuono, the Scorecard result a 0.1% difference between the two. 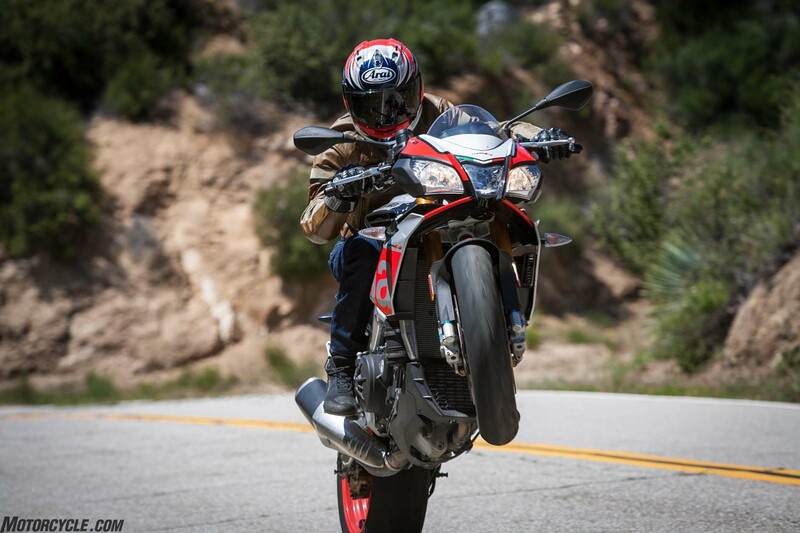 The Tuono boasts more horsepower than the other bikes, but its torque production is average. Moving 2.9 pounds per horsepower, and 5.6 pounds per pound-foot keeps things about equal with the EBR, and a little better than the Triumph or Yamaha. Riding results between the four bikes should prove to be very interesting. 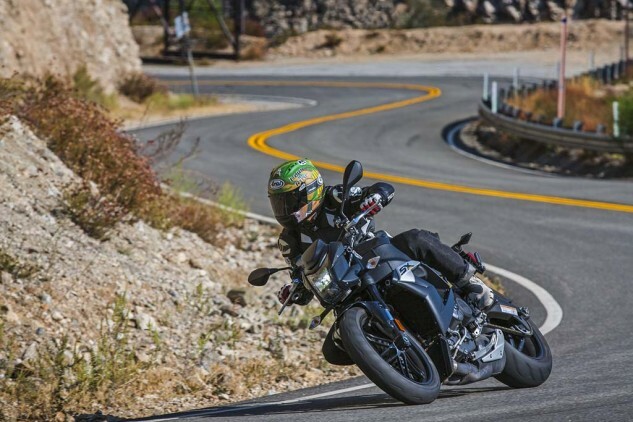 In the Features department the Aprilia boasts a quick-shifter but no cruise control, the Yamaha just the opposite, and the EBR is void of electronics except traction control. 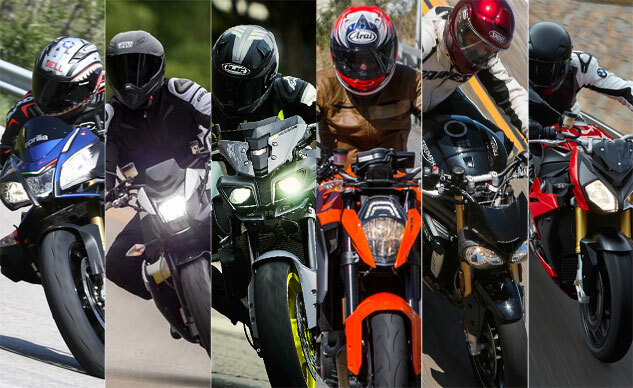 For your perusal, the specifications of each bike as we know them. Each was weighed and dyno’d by us, therefore providing real-world figures, not inflated claims from OEMs measuring horsepower at the crankshaft. Look for our full shootout report in the near future. Rake/Trail 24.7 deg/3.9 in 24.6º/3.9 in 22.4 º/3.8 in 24.9º/4.21 in 22.9º/3.6 in 24.0º/4.0 in. Wheelbase 57.1 in. 56.7 in 55.5 in. 58.3 in. 56.5 in. 55.1 in. Seat Height 32.5 in. 32.0 in 32.5 in. 32.9 in. 32.5 in. 32.5 in. Curb Weight 465 lbs. 459 lbs 448.6 lbs. 468.2 lbs 478 lbs. 463 lbs. Fuel Capacity 4.9 gal. 4.6 gal 4.5 gal. 4.7 gals. 4.1 gal. 4.5 gal.